This quote has inspired my horse journey for many years, and has allowed me – and my students – to forgive ourselves for prior training and handling that wasn’t in line with what we know now. I did the best I could with what I knew then. And I keep learning, so that in the future, I can do even better. The “Do Better” series will include the things I hope we, as Miniature Horse enthusiasts, can do better. It isn’t meant to call anyone out on poor horsemanship – remember, we’re all doing the best we can with what we know now. All we can do is learn, so we can do better. That shouldn’t really be news, it’s true of horses of any size, of any other animal, even of humans. We all have our own metabolism, and we all need a different amount or type of food to thrive. 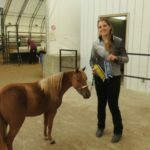 Unfortunately, when a new owner of a Miniature Horse first starts asking questions about what to feed their new addition, they are often given absolutes. The list goes on, but those are the two I hear most often and I think do the most harm. And they could very well be true statements for some horses, but certainly not all, or even most. Even a good balanced diet that works well for one horse, might not be right for another. I have horses here that are decidedly “easy keepers” (a misnomer if ever there was, a term applied to those who gain weight easily, but actually means they are much more difficult to manage), and others who need a large amount of nutrition to maintain a healthy weight. 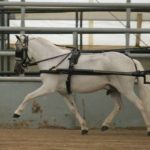 These absolutes also fail to take into account the age of the horse, and when most people tend to start with a young horse, they’re in trouble right away. Weanlings and yearlings are growing fast, and they need a LOT of nutrition. Well meant advice about limiting feed to avoid founder results in sickly malnourished youngsters, coupled with thick winter coats, and new owners might not even know they were starving their new baby until springtime when a body clip reveals a whole lot of bones and a big belly indicative of malnutrition hidden beneath the hair. 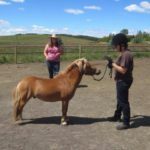 While common wisdom is that Miniature Horses get too fat too easily and must be on a restricted feeding program to stay healthy – and there are certainly horses like that! – in my travels I see far more horses who are too thin because someone has convinced a new owner that they must feed their horses the bare minimum. 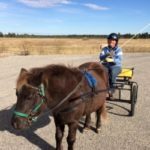 Miniature Horses can eat grass – it may need to be restricted based on the amount and quality of the pasture, and the metabolism of the horse, but grass is what horses evolved to eat, and it is very good for them. 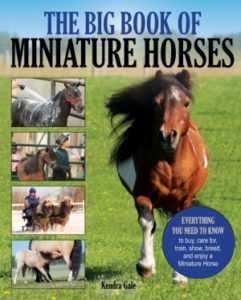 There are exceptions, of course, for those with metabolic disorders, and each individual needs to be treated as an individual, but the majority of Miniature Horses can eat grass as their primary feed source when it’s available and be very happy and healthy. My yearlings at their first show this summer. They were on pasture 24/7 plus 4 cups of 16% complete feed twice daily. Even show horses can eat grass and look nice, especially young horses. Instead of telling newcomers what they MUST or MUST NOT feed, let’s instead give them an idea of where to start, and then teach them to monitor their horse’s body condition and make adjustments as needed to maintain a healthy weight. It’s so sad to see new owners with underweight horses, and then learn that the breeder of the horses had told them to only feed a handful of hay per day, through the cold of an Alberta winter. Miniature Horses are individuals and need to be fed for their individual health. We can do better.